In Los Angeles, our highest aspirations used to involve the struggle to obtain a share of the power, so that we Angelenos and our different dreams would be protected and included, not excluded. Today, now that so many more of us are included, our highest aspirations are more widely shared. And we struggle with how to share power so that we might navigate the complicated path to realizing our dreams. Think back to 1960, when Los Angeles was incredibly white and there were twice as many blacks as Latinos. Minority groups, including Asian-Americans and Jews, were excluded from good schools and public sector jobs like police and fire—and were subject to police harassment and other forms of institutional racism. How to achieve such aspirations? The theory—perhaps best outlined in the 1984 book Protest Is Not Enough, in which scholars looked at blacks and Latinos in the urban politics of Northern California—had three parts. First, mobilization. Mobilize to achieve voting rights. Second, once you have voting rights, use them to achieve representation—the election of members of minority groups. Third, once you have representation, those new politicians will be responsive to your aspirations. The thinking was: If there could be a black mayor, he could prevent the police from treating black people so shabbily. If you could elect black or Latino mayors, they could prevent housing segregation and the development of ghettos. If you could have a minority running the Los Angeles Unified School District, minority kids would finally have the same educational opportunity that other kids enjoyed. With political power, you could do anything. A half-century later, progress on the first two parts of the theory are undeniable. Voting rights and representation are realities. Once-excluded groups are now major players in governing, driving the dialogue, and the political process. A black person (Tom Bradley) and a Latino (Antonio Villaraigosa) have been mayors of Los Angeles. Jews have held every conceivable position in the city; today the three at-large elected officials (Mayor Garcetti, City Attorney Mike Feuer, and City Controller Ron Galperin) are all Jewish or half-Jewish. And among Asian-American politicians, Ted Lieu has won a signature Westside congressional seat; John Chiang, of Torrance, is state treasurer; and Asian-Americans hold majority status on city councils in the San Gabriel Valley, including one of our region’s wealthiest cities, San Marino. But minority representation in elective offices, while crucial, hasn’t achieved all our aspirations. Police brutality is diminished, but remains. Discrimination in housing, while legally barred, remains a reality. Economic inequality has grown. Los Angeles’ progress—and its persistent problems—remind us that minority representation doesn’t naturally translate to getting the change we want. Responsiveness to the concerns of different groups, we’ve learned, requires more than representation of those groups. It requires coalition and inclusion—specifically, minority inclusion in coalitions that are broad enough and strong enough to dominate a city or county government, and thus make change. And even then, political power, Angelenos have learned by experience, is not all that powerful; political officials have limited impact on economic, social, and cultural decision-making. If anything, power works the other way around—with economic, social, and cultural power forcing political change. This has flipped our aspirations in Los Angeles. People here now aspire to change by making our culture, our social lives, our economic realities more inclusive first. Politics comes later. The best examples in L.A., and in California, are the myriad efforts to recognize immigrants, documented or undocumented, as full participants in the life of the city. We want to make sure they have the same access to health care, transportation, and police services, and are willing to challenge or flout federal laws. The idea is that if we model inclusion, maybe bigger government and legal change—like comprehensive immigration reform—will follow. Los Angeles’ progress—and its persistent problems—remind us that minority representation doesn’t naturally translate to getting the change we want. This aspiration for coalition, for connecting and representing people from other groups, is best reflected in the way that African-American politicians in Los Angeles are aggressively seeking to represent Latino concerns. Every single black elected official in the county has more Latinos than blacks in his or her district. Not long ago, if you visited a black elected official’s office, most of the staffers were black. Today, it’s not unusual for the majority to be Latino. The chief of staff to Marqueece Harris-Dawson is Latino. Councilman Curren Price’s staff is largely Latino. Of course, Mayor Tom Bradley pioneered this sort of diverse hiring a generation ago. Today, every elected official must be Tom Bradley. Coalition is also an aspiration because our aspirations are more complicated, and more difficult to achieve. Chief among these is the aspiration of reducing income inequality. We want the very stubborn issue of housing—and the lack of affordable high-quality housing in the places we want to live—to be addressed now. And we aspire to fix homelessness, to achieve environmental and social justice, and to reverse and mitigate climate change. These goals are broadly shared; the difficulty is figuring out how. And those are challenges that can’t be effectively addressed by one group or one city administration. Los Angeles can be a cynical place, and there are many who say we can’t solve our problems. But we must aspire to do more, much more, than we are doing now. I wish we had even greater aspirations to increase wages. And I wish we would focus even more on figuring out affordable housing. None of the models we’ve tried have worked, or can work. We should aspire to a revolution in housing, brand new ways to build housing and communities. As we seek coalition, we are changing how we see ourselves. In surveys, I see us developing an “Angeleno identity,” a clear sense that being in L.A. defines us. I don’t want to suggest this is as post-racial identity; you can be very African-American, very Latino, very white, and still consider yourself very Angeleno. But there is a stronger sense that our fates are linked. How Koreans do in L.A. will impact how Latinos do in L.A.—and blacks and Jews. The Republican company owner who needs workers wants better schools for kids in South L.A.; the Guatemalan nanny and the attorney trying to get to court know they need shorter commutes; the upper middle-class Pasadena family with an asthmatic kid worries about what’s being put into the air by industry in southeast L.A. County neighborhoods. Our grandest aspirations in today’s Los Angeles are the ones we all share. Fernando Guerra is professor of political science and Chicana/o studies and director of the Thomas and Dorothy Leavey Center for the Study of Los Angeles at Loyola Marymount University.This essay is part of Is L.A. Still a City of Big Dreams?, a project of Zócalo Public Square. 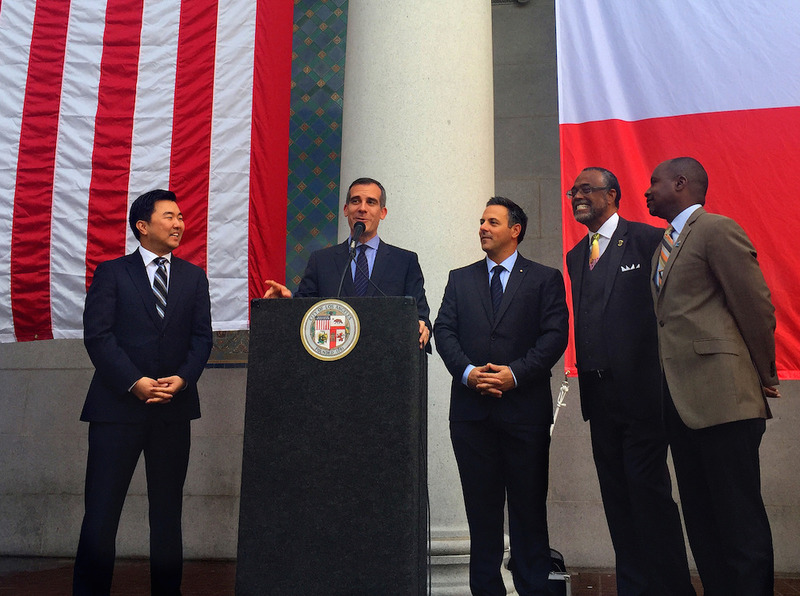 *Photo courtesy of Eric Garcetti.